Oh, that looks yummy - I love her recipes, I have to say. They're always relatively simple but very good. I can't wait to give it a try! hahaha perfect :-) mmm, and I love ribs! That would be perfect for me--I'm not into the licking the fingers thing! *laugh* taste is sacrificed for convenience. It looks like an old fashioned bee hive to me. I love ribs and wish I could afford to have them more often. I swear I could eat that for breakfast. Love the pic! We keep telling W. he needs his own blog ... but it's good when he supplies guest posts/ideas too. 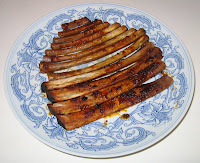 I see a number of comments about the ribs but not much about the fact your husband wanted you to TAKE A PICTURE FOR YOUR BLOG. He has it, doesn't he? Blogomania. He goes to work and unbeknownst to you has all of his buddies read your blog because he knows how funny your are but doesn't want you to know how secretly proud of you he is....or he would lose one of the tools he THINKS he has in his pocket to annoy you with - mocking you about your blog. Well the gigs up, buddy. Next time he rags you can tell him you've found him out!